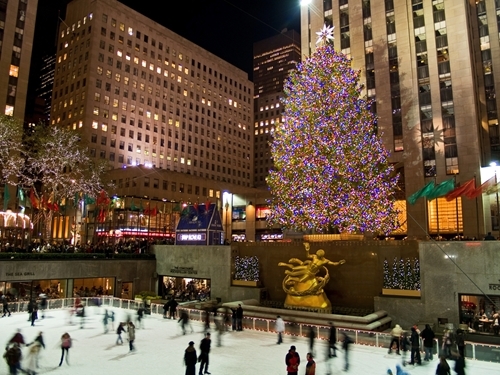 This year, the Christmas tree that stands in front of Rockefeller Center will reach almost nine stories into the air and weigh 13 tons, USA Today reported. When officials throw the switch to light the tree the night of Dec. 3, more than 45,000 LED lights and a tree-topper star made by Swarovski will snap into brilliant, shining focus. You don’t have to be in Rockefeller Center to have your own Christmas kickoff party though. In fact, this is a great opportunity to draw customers to your store by holding your very own tree lighting party. Get a tree that fits your store and invite customers to decorate it as they shop. Cap the night off with your own countdown and dramatic lighting. In the true Christmas spirit, make sure you have promotional giveaways on hand to pass out to any customer in the store – Myron’s Mr. Christmas Rustic Lantern Music Box is a decorative product perfect for the holiday season. Customers can bring this home to place on their mantles like any other Christmas decoration, except this one is customized with your company’s logo. As social media turns the retail game away from brick-and-mortar storefronts, Forbes magazine explained that in-store events are the secret weapon of the small business owner. It’s not enough to just stock shelves and open doors – customers can get the exact same experience on the computer at home. If you turn your store into a winter wonderland complete with a tree lighting and custom promotional products, people are sure to turn up. After the lighting on Dec. 3, the Christmas tree at Rockefeller Center will stay lit until Jan. 7, though if your in-store event draws in customers, there’s not reason not to have a similar show every night. Just make sure you have enough custom promotional products to complete the holiday atmosphere.